On Christmas Eve, we received a package from Walter Marker, 5th dan, who has dojos in Houston, Texas, connected with Aikido Kobayashi Dojo. In the package were two photographs and patches. He works at the Johnson Space Center and one of his students is Michael Barrett, an aikido shodan and an astronaut. Michael Barrett stayed on the Space Station from March to October 2009, together with Japanese astronaut Koichi Wakata. I’ve talked about this in a previous blog, so there may be some of you who remember. He sent signed photographs for myself and assistant Dojocho, Hiroaki. 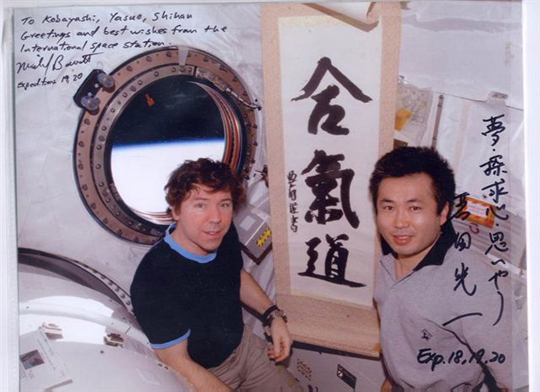 The enclosed photographs showed Michael Barrett and Koichi Wada on the International Space Station, with a calligraphy of mine that I had sent, in front of a port hole through which you can see the curve of the earth. Interestingly, Mr Wakata, had never practiced aikido and was told about it by an American astronaut who is an aikido shodan. It can truly be said that aikido has become international. In the instructors blog it said that there was an aikido demonstration held in space. I don’t know whether or not they were able to do that. They are supposedly assembling some images of the event. 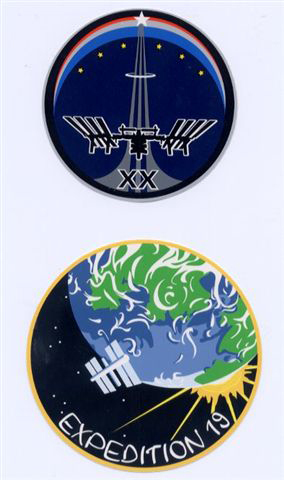 When we first started Aikido Kobayashi Dojos, we joked that some day we would take aikido into space. What we said came true. Now Aikido Kobayashi Dojos will try to push aikido into even newer frontiers.